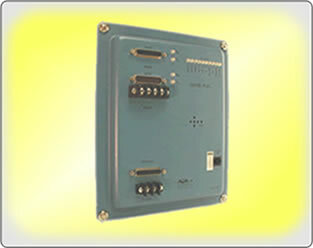 The UNIVERSAL WEB STATION provides multi-port/multi-protocol communications interface/translation. 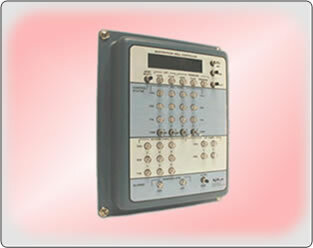 It allows different Control and Monitoring schemes to be integrated into a single system without interface problems. This avoids unexpected software expenses and extends the useful life of legacy equipment. The UNIVERSAL WEB STATION also incorporates your Intranet and the Internet for providing Control and Monitoring over a large area or from anywhere you have Ethernet connectivity and a WEB page browser. Telnet function allows users to communicate directly with connected sensors. Email/Text Messaging: This a very useful tool for monitoring and diagnosing system operating performance. 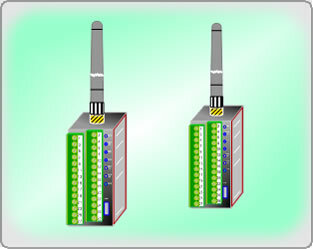 The UWS can be configured to transmit messages both on event and interval. Telnet: The UWS connects your computer key board directly to the field sensor through your network, allowing remote sensor configuration changes to be made. Multiple Protocols: To extend the life of an existing system, it may be necessary to mix several different protocols. 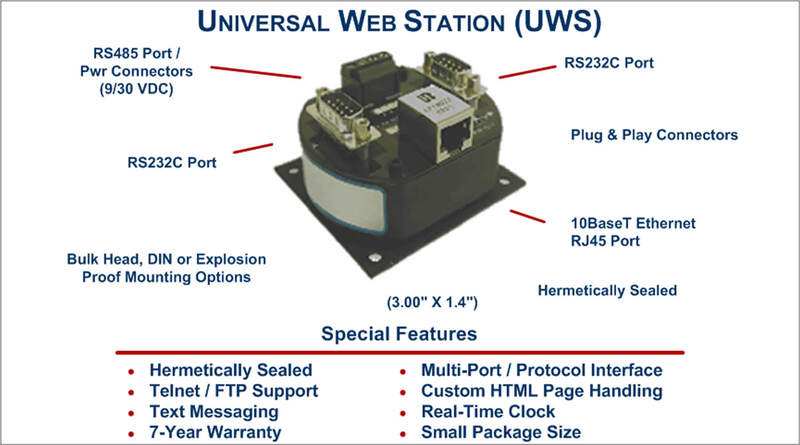 Because of the micro-controller/object oriented programming approach, the UWS is easily configured to accommodate a large variety of requirements. HTTP WEB Page Server: Viewing your field data is as easy as connecting to the internet with your favorite WEB Browser. You can also customize your WEB pages and upload them using File Transfer Protocol (FTP). Remote Diagnostics Tool: The DLM Technical support is available directly from Tucson using an Internet connection. The AGM Domain engineering staff is able to provide immediate support for diagnosing and resolving systemic problems. o TCP/IP Port Assignment Protection: Changes will be confirmed by reconnecting within specified period of time. o Addresses: Individually selectable for each of the 4 ports. For some protocols, addressing may be done on an individual variable. o Variable: Up to 32 values may be selected for translation. For each value, one source port and up to 3 destination ports may be selected. o Master Protocol Modes: Collect or update translated data individually. Device address may be specified as well as variable address for each of the 32 values. § Configuration may be cloned via FTP. § Port T, Ethernet TCP/IP. The following table is a compilation of a few of the many applications that the AGM Universal WEB Station (UWS) can be applied to. If you have an application that you are uncertain as to whether or not the Universal WEB Station is the correct product to apply, contact AGM's Technical Support Team and they will work with you to insure that the correct product is selected for your design requirements.